The lists for NZ buses on this site have not been updated since 23rd August, 2014. I moved to NZ in May, 2014 and initially helped with data for the fleet lists here. Since then I have created a set of lists for the larger companies [using the data base here]. For visitors to NZ, there has been no up to date data. MANA / Naked [I think this is in a state of change with vehicles being renumbered and maybe leaving Johnstons fleet]. a few single/dual vehicle operators seen at Fox Glacier. The data has a date and is in the year 16 / month Jan / date 03 form. NZ has a wonderful site "carjam" which gives all the details of a registration number - helps populate the database. I am seeking assistance from a number of locals to continue to add value to the lists. I will add other operators as details become available. Really great work there Peter. Skybus appear to have moved into the former Johnson Depot. Last edited by LB608 on Sun Jan 03, 2016 6:19 pm, edited 1 time in total. Mana is Howick & Eastern. Thanks for the Johnsons update. Still waiting for a complete list for Fullers/Waiheke Buses. Naked Bus is a mess - taking on vehicles especially from Johnstons - but it has become clearer thanks to this posting from bjg154. The buses in early series 201 are Volvo B12 and the series 251 onwards are Scania K124. (513) GJU 566 is also on your Red Bus list as (113) Moved to Red Bus recently photographed at Fox Glacier. (516) GSH 259 is also on your Red Bus list as (112) Moved to Red Bus recently photographed at Fox Glacier. (701) and (1254) are the same coach 701 was the Sleep coach version - renumbered and reliveried - no longer operates as far as I can see from website. Back to 1257. Some other Johnston's re-registrations are as follows. (1242) AWG 584, JCL 42, GQW 193. Has been advertised for sale. bjg154 wrote: Some other Johnston's re-registrations are as follows. (500) JCL 06 now HLZ 146 NOW Naked Bus 256. The Bus Fleet Lists grows - 5,400 entries and 100 operators. A new group has been added - Tourism Service Shuttles for specific branded buses operating shuttles to/from tourism locations. Tamaki at Rotorua is complete. Hobbiton is just one bus until now. Another feature is the Cross Reference list which lists all registrations in alphabetical order [2 groups, based on 2 or 3 letter plates]. If a registration is seen/noted for an unknown operator, check the list to see if the registration is in the list, then the operator at the end is cross referenced to the group. I have been fortunate to make some road trips to add to the database. GoBus in Queenstown/Arrowtown has more entries, plus more West Coast tourism operators and charters/tour vehicles added. Go Bus in Pukururu, Tokoroa, Parekarangi and Napier/Hastings has more confirmations. Go Bus has an added feature - coloured shadings over town/city name to denote a confirmed location - still to see a lot of small places, plus a Hamilton visit planned for April. Reesby in Rotorua has had fleet numbers 24-32 removed [Rosas], and added are the Naked Bus 00 bus seen on the Greymouth - Glaciers services is in the Rotorua yard, plus a number 98. #10, 13, 18, 20, 42, 71, 72, 106, 109, 113, 115, 120, 225, 231. Waipawa depots at Taupo and Hastings were visited and an almost complete list produced. Still 3 more locations to check out. Nimons and Waipawa Depots are noted by letters at the end of the entry with the key beside the operator name. A number of emails with updates have been received and have improved the accuracy of the database. Any contributions very welcome. You do know that Howick & Eastern Have 3 depots,don't you? You didn't know about Johnsons moving until I told you.I will just wait to see what other information I have to give you. I have been out of New Zealand for 2 weeks, so only just saw your message. I have picked up the remnants of the fleet lists which have been dormant here since August 2014. I am using the data from there as a starting point. I value any information which is provided and can add to the correctness of the site. I did not know that H&E had three depots - I know that they have an operation on Waiheke Island. I followed up your lead on the Johnstons depot - the office is where you stated, the buses are kept in an area which is inaccessible in the rail development off Neilson Street. I have reduced the Johnstns fleet as suggested by bjg154. I am attempting to pull together data from all over New Zealand, and have quite a number of useful contacts who are correcting the errors. Please let me know if anything which you think needs correcting. In collaboration with board user BusPlaneTrainTram, we have spent the past few weeks working on migrating the active Fleet Lists currently provided to the NZ section of the Australian Bus Fleet Lists. There are a few format errors to fix to enable the summary pages for each operator to work properly, however the basic functionality of viewing each Fleet List is working already. Following the successful migration, the lists on the google site will be removed on Friday, 17th March 2017. Many would be aware that this site had hosted NZ Fleet Lists for a few years pre-2014, however was unfortunately ceased due to other commitments arising. As a result, BusPlaneTrainTram stepped in and put in some great work to maintain the presence of NZ Fleet Lists using another site. In the best interests of those who use the Fleet Lists, to improve consistency and the benefits of having the lists in an actual database, we decided that in the longer term, it'll be better to have the lists hosted on the Bus Australia website. For those who wish to view lists that were originally hosted on the Bus Australia website three years ago, we have kept this option by migrating the lists that were previously there to the Historic Lists section. BusPlaneTrainTram will continue to maintain and update these lists and any assistance or contributions are very welcome and should continue to be directed to him. Contact details on the Australian Bus Fleet Lists site will be updated to reflect the new NZ Fleet Lists updater soon. In the meantime, my focus will be on fixing some of the outstanding issues related to getting the summary pages for each operator to work properly as well as ongoing consistency and legibility improvements of the data that will in turn, hopefully improve search functionality for those navigating the lists. New Zealand Coach Service - Leyland Leopard JK2823, fleet number 186. Plate does not appear in a search of the fleetlists. 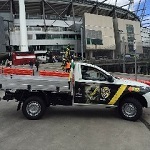 https://www.carjam.co.nz/car/?plate=JK2823. I have a photo if it will help. Unknown operator - Volvo B10M TZ1660 former trolleybus converted to diesel. 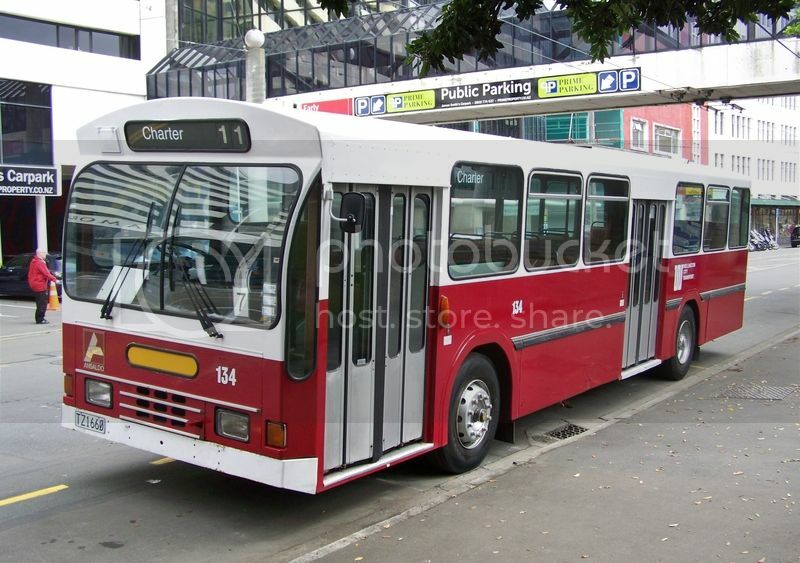 Shown in Nimon and Sons Ltd - Hawkes Bay fleetlist, now painted in Wellington City Transport red livery with fleet number 134. No operator name shown on the off side, appeared to be laid up awaiting pickup of a charter group with NCS vehicles. Thanks for these updates. Will add 186 now. 134 has been privately restored by Peter Hill. Maybe it is chartered as needed. Records of Nimon updated to "Withdrawn status" and notification of preservation. On the windscreen of NZ buses, usually on one of the small slips in the plastic covers, is a notation of the operator [these are issued 6 monthly as a Certificate of Fitness for commercial vehicles]. Peter Hill has done a great job on 134, hope he's got somewhere undercover to store it. Thanks for the tip about the operator name being with the CoF. do grand pacific have many coaches?? I believe this bus is now with Bentley Charters in Christchurch.